Two historic buildings nestled in the Cradle Valley lie at the edge of the Rathfinny Wine Estate, and have been beautifully restored and extended to the highest standard, forming a beautifully appointed “home away from home." A large, welcoming dining room, serving locally sourced home-cooked meals, is complemented by a separate lounge, both with fireplaces, and a lovely enclosed courtyard. All bedrooms are en suite. A fine Elizabethan manor house with lavishly decorated en-suite rooms, outstanding spa, and a fine-dining restaurant set in eight acres of beautiful grounds overlooking Cuckfield Park. With its history and character, elegant sitting room warmed by a roaring log fire and cosy, wood-paneled bar, Ockenden Manor is a wonderful place to escape to and it's less than an hour from London. Zoe Mantarakis Wenger is a longtime teacher and mentor in the Austin, TX Yoga community. She is known for her uniquely sequenced Hatha Flow classes. Her teachings skillfully blend the precise art of Yoga alignment with philosophy and relaxation techniques that guide all levels of students toward self-knowledge, peace, and a blissful abidance in the present moment. Having nearly two decades of Yoga teaching experience, and voted Austin's best Yoga Teacher of 2014, she is able to share a depth of knowledge with the seasoned Yoga practitioner as well as those just beginning their paths. She leads national conferences, international Yoga retreats, and 200hr Teacher Training Certification. "Zoe's yoga was so amazing, and it was obvious that somehow she tailored it perfectly to our trip and our glorious retreat with a 'theme' every time we practiced!" Each day begins with two hours of yoga with Zoe, either overlooking the vineyards, on the manor grounds, or privately tucked away in the hotel spa. The south of England is the world's most exciting new region for sparkling wine. 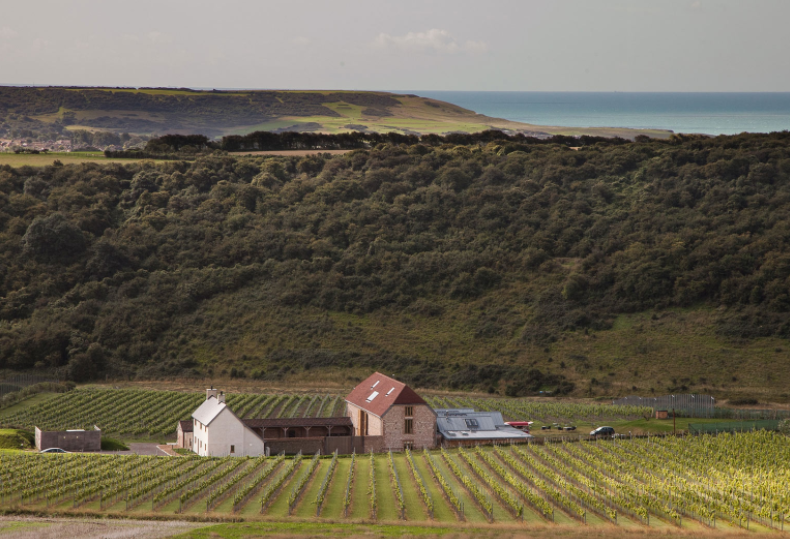 With 8 winery visits across 3 counties, guests will taste the best of English fizz. Coastal walks, a Tudor village, nightlife in Brighton, afternoon tea, and an option to extend your stay with a few days in London. Anglophiles rejoice! Why England? Do they even make wine in England? Yes, they do! The south of England shares the same chalky soil that runs through Champagne in France, making the region particularly well suited for the Pinot noir, Pinot Meunier, and chardonnay grapes that are the building blocks of champagne. In fact, so ideal is the English terrain that famous Champagne Taittinger is planting acres in Kent. But English producers aren't merely aping champagne. Instead they are developing their own style, both in sparkling and still varieties. A few producers have made their way into major markets in the US, but most English fizz is still unavailable outside of the UK. Here are just a few of the write-ups in recent years about English wine. What is the single supplement option? Guests who wish to have a private room throughout the stay may upgrade for $500. This additional fee covers the increased cost of hotel accommodations. Please note that due to the limited number of rooms available at the Flint Barns, there are only three spots available for single occupancy. All rooms are en suite. What is the triple occupancy option? Guests who wish to share accommodations three to a room may do so at a reduced fee of -$200 per person (for a total of $600 in savings). At the Flint Barns, triple occupancy rooms are single and bunk beds. At Ockenden Manor Hotel, triple occupancy rooms are spa suites with one double bed and one sofa bed. At the Sofitel Gatwick Hotel, triple rooms are one double bed and one single bed. All rooms are en suite. How experienced do I need to be at practicing yoga? Zoe has been teaching yoga for more than 15 years and excels at teaching participants of all levels. No prior yoga experience is required, but each day includes a two hour yoga session that will allow more experienced practitioners to delve deep into their practices. Do I need to bring my own yoga mat and props? No! Part of your tour fee includes a yoga mat, strap, and two blocks. The mat and props are yours to take home at the end of the stay, but if you prefer not to have the extra luggage (because your suitcase is too full of wine!) you are also welcome to leave the mat and props with your tour guide. Please see above for a detailed list of items included in the tour price. In general, all of your accommodations, all of your ground transportation, all of your tour and tasting fees, most of your meals, and all of your yoga sessions and props are included. Items not included are airfare, travel insurance, meals not listed in the itinerary, incidentals, tips, and personal expenses. Do I need to have a previous knowledge of wine? Definitely not. But a healthy curiosity will help. We'll begin our trip with a welcome dinner in which we'll learn about the basics of wine tasting and the importance of England as burgeoning region for sparkling production. Over the next 5 days, you'll have an opportunity to taste a variety of wines and speak with winemakers and wine educators, but you do not need to enter these conversations with any prior knowledge of wine. In late April, average highs are about 58 degrees F and average lows are about 43 degrees F. England can, of course, be wet. Rain coats are always advised! Since we will be walking through vineyards, you should pack a comfortable pair of water-resistant shoes that you don't mind getting dirty. Clothes should be comfortable and include layers. For the most part, casual attire is appropriate, although you may prefer to dress up slightly during afternoon tea. Yoga clothes are a must. And a bathing suit for the hotel pool and spa are recommended. Please click here or follow the Register buttons on this page to complete the registration form online. If you prefer, you may also download the registration form here and mail it to Uncharted Territories Tours, LLC. 1801 E. 51st Street, Suite 180-365, Austin, TX 78723. To secure your spot you must submit a non-refundable $800 deposit either via check or credit card. You will receive a confirmation via email within 48 hours of receipt of your payment. Please do not book any related travel before you receive an additional confirmation that the minimum number of participants (8 guests) has been met. Can I purchase my own airline flight? You can, but it is highly recommended that you book through Uncharted Territories, which can be done at no additional fee. Uncharted Territories will provide you with the best flight options and prices available. Yes, travel insurance is strongly recommended. Please review our Participant Agreement for full details, but travel insurance will help to protect the cost of your trip in the event of unforeseen cancellations. What optional upgrades are there? So glad you asked! During your stay at Ockenden Manor Hotel & Spa there are a number of spa packages you may wish to add. Please view their menu here. Uncharted Territories will be happy to book these on your behalf, as well as any room upgrades you might wish. Before or after your tour, you may wish to extend your stay and visit London. Uncharted Territories is happy to help with hotel bookings, ground transportation, restaurant reservations, private museum tours, theatre tickets, and much more. Let us customize an unforgettable trip for you! Contact us at info@unchartedterritoriestours.com to get started. Thank you for your interest! We will respond to your inquiry soon.